Objective: Recombinant human erythropoietin (rhEPO) therapy under circumstances of moderate chronic renal failure (CRF), with yet lower kidney and heart lesion, may have a protective cardiac effect beyond the correction of anemia, whose mechanism deserves better elucidation, namely by clarifying the impact on gene expression profile of markers of apoptosis, inflammation, proliferation, angiogenesis, and lesion/stress in the heart. Materials and Methods: Four groups of rats were studied over a period of 15 weeks (n=7 each): control-without surgery and without drug treatment; rhEPO-treated with 50 IU/kg/week of rhEPO-beta; CRF-submitted to partial nephrectomy (3/4); CRF + rhEPO-CRF with rhEPO treatment after the 3rd week of surgery. The heart was collected in order to evaluate the gene expression, by real-time qPCR, of markers of apoptotic machinery, inflammation/immunology, proliferation/angiogenesis, and lesion/stress. 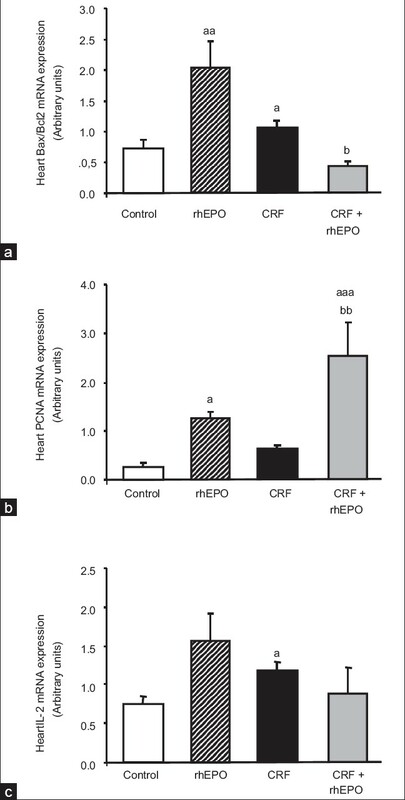 Results: The main findings obtained were (a) CRF rats have demonstrated overexpression of EPO-R in the heart without changes on EPO expression, together with overexpression of Bax/Bcl2 ratio, PCNA, and IL-2; (b) rhEPO therapy on the heart of the rats with CRF induced by partial 3/4 nephrectomy promoted nonhematopoietic protection, demonstrated by the apoptosis prevention, viewed by the Bax/Bcl2 balance, by the promotion of proliferation, due to PCNA increment, and by the immunomodulatory action, expressed by a trend to prevent the IL-2 increment. Conclusion: In this model of moderate CRF, rhEPO treatment showed important cardiac nonhematopoietic effects, expressed mainly by the antiapoptotic and the proproliferative action, suggesting that early rhEPO therapy in moderate stages of CRF might have further therapeutic benefits. The use of recombinant human erythropoietin (rhEPO) has emerged in the early 1990s as the most appropriate method to control anemia in patients with CRF, and was responsible for a better and longer life in those patients, both from amelioration of anemia and beneficial cardiovascular impact. ,, Therefore, EPO has been recognized as a key player in a broad variety of processes in cardiovascular pathophysiology, including apoptosis, cell proliferation, ischemia, and the nitric oxide (NO) pathway, which reinforces their putative use in nonhematological conditions. However, for a significant percentage of patients, rhEPO loses efficacy, becoming resistant, recommending dose increment with further deterioration of heart function, most probably due to the expected hyperviscosity and thromboembolisms. ,,, Therefore, although enhanced EPO synthesis is viewed as an appropriate compensatory mechanism in the cardiorenal syndrome, excessive EPO synthesis in the advanced stages of both the chronic renal failure (CRF) and congestive heart failure appears to be predictive of higher mortality. Thus, early rhEPO use, in stages of yet moderate renal failure and initial cardiac deterioration, might have additional benefits. However, this impact remains poorly investigated. Considering that the use of human tissues is obviously limited by ethical reasons, our group has previously extensively characterized a model of moderate CRF,  in which rhEPO treatment has promoted erythrocytosis and prevented tachycardia, catecholamines increment and dyslipidemia, with a rise of serum TGF-b1. , Thus, rhEPO therapy, under these circumstances, has promoted a beneficial effect on the cardiac tissue, which might be attributed to its protective actions, namely of proproliferative and antiapoptotic nature, as was previously suggested in other conditions and pathologies, ,,, but that deserves a more extensive evaluation, particularly in moderate stages of CKD, before critical impairment of the kidney and heart tissues. This study was designed to assess the effects of rhEPO therapy on heart gene expression profile in a moderate stage of CRF. We hypothesize that rhEPO use under these circumstances of lower tissue lesion/impairment may have a protective effect beyond the correction of anemia, whose mechanism deserves better elucidation by clarifying the impact on gene expression profile of several markers of apoptosis, inflammation, proliferation, angiogenesis, and lesion/stress. Male Wistar rats (Charles River Lab. Inc., Barcelona, Spain), weighing ±275 g, were maintained in an air conditioned room, subjected to 12:12 h dark/light cycles and given standard rat chow (IPM-R20, Letica, Barcelona, Spain) and free access to tap water. Animal experiments were conducted according to the European Communities Council Directives on Animal Care. The rats were divided into 4 groups (7 rats each), during a 15-week protocol: control-without drugs and surgery; rhEPO(beta)-50 IU/kg/week s.c. Recormon® (Roche Pharmaceuticals), without surgery; CRF-induced by a 2-stage (3/4) nephrectomy: first, about half of the left kidney was removed and, 1 week later, the entire right kidney was removed; CRF+rhEPO-treated with rhEPO after the 3rd week of surgery. All the animals have completed the protocol. Control sham-operated rats were considered not required based on preliminary studies from us, which have demonstrated a similar pattern for hematologic and renal parameters with the nonoperated controls throughout the treatment period. Blood samples were collected in rats under intraperitoneal anesthesia with a 2 mg/kg body weight of a 2:1 (v:v) 50 mg/mL ketamine (Ketalar® , Parke-Davis, Lab. Pfeizer Lda, Seixal, Portugal) solution in 2.5% chlorpromazine (Largactil® , Rhàne-Poulenc Rorer, Lab. Vitória, Amadora, Portugal), by venipuncture from the jugular vein into syringes without an anticoagulant (for serum sample collection) or with EDTA for hematologic studies. Serum creatinine, urea, and uric acid concentrations were used as renal function indexes through automatic validated methods and equipments (Hitachi 717 analyzer). Red blood cell (RBC) count, hematocrit (HTC), and hemoglobin (Hb) concentration were assessed in whole blood EDTA by using an automatic Coulter Counter® (Beckman Coulter Inc., CA, USA). The rats were sacrificed by cervical dislocation, under intraperitoneal anesthesia, previously described, and the heart was immediately removed, placed in ice-cold Krebs buffer and carefully cleaned of adherent fat and connective tissue, freezing therefore in RNA later™ tubes at -80°C. The heart was isolated in autopsy and stored in RNA later™ solution (Ambion, Austin, TX, USA). Samples were removed from preservation solution and 1200 μL of RLT Lysis Buffer were added to proceed with disruption and homogenization for 2 min at 30 Hz using TissueLyser (Qiagen, Hilden, Germany). Tissue lysate were processed according to the protocol from RNeasy® Mini Kit (Qiagen, Hilden, Germany). Total RNA was eluted in 50 μL of RNase-free water (without optional treatment with DNAse). In order to quantify the amount of total RNA extracted and verify RNA integrity (RIN, RNA Integrity Number), samples were analyzed using 6000 Nano Chip® kit, in Agilent 2100 bioanalyzer (Agilent Technologies, Walbronn, Germany) and 2100 expert software, following manufacturer instructions. The yield from isolation was from 0.5 to 3 μg; RIN values were 6.0-9.0 and purity (A 260 /A 280 ) was 1.8-2.0. RNA was reverse transcribed with SuperScript™ III first-strand synthesis system for RT-PCR (Invitrogen, California, USA). One microgram of total RNA was mixed with a 2× First-Strand Reaction Mix and a SuperScript™ III Enzyme Mix (Oligo(dT) plus Random hexamers). Reactions were carried out in a thermocycler Gene Amp PCR System 9600 (Perkin Elmer, Norwalk, CT, USA), 10 min at 25°C, 50 min at 50°C and 5 min at 85°C. Reaction products were then digested with 1 μL RNase H for 20 min at 37°C and, finally, cDNA eluted to a final volume of 100 μL and stored at −20°C. For statistical analysis, we used the GraphPad Prism, Version 5.0. Results are presented as means ± standard error of means (SEM). Comparisons between groups were performed using ANOVA and the post hoc Bonferroni test. Significance was accepted at P < 0.05. In [Table 1] we present the renal function markers and hematologic data for the different groups, before starting experiments and at the end of the experimental period (15 weeks: 12 weeks after partial nephrectomy). There was a statistically significant increase in serum creatinine and urea concentrations at 3 weeks after surgery (data not shown), and this increase in renal function markers remained high along the following 12 weeks of the experimental procedure. The rhEPO treatment in the CRF animals produced no significant effects in those parameters [Table 1]. Concerning to hematologic data, 3 weeks after nephrectomy, the CRF animals showed a statistically significant decrease for RBC count, HTC, and Hb (data not shown). These parameters normalized in the laboratorial evaluation performed 9 weeks after surgical intervention and remained stable until the end of the follow-up period. The rhEPO treatment in the CRF animals (CRF+rhEPO group) showed a trend to increased hematologic values (RBC, HTC, and Hb) [Table 1]. 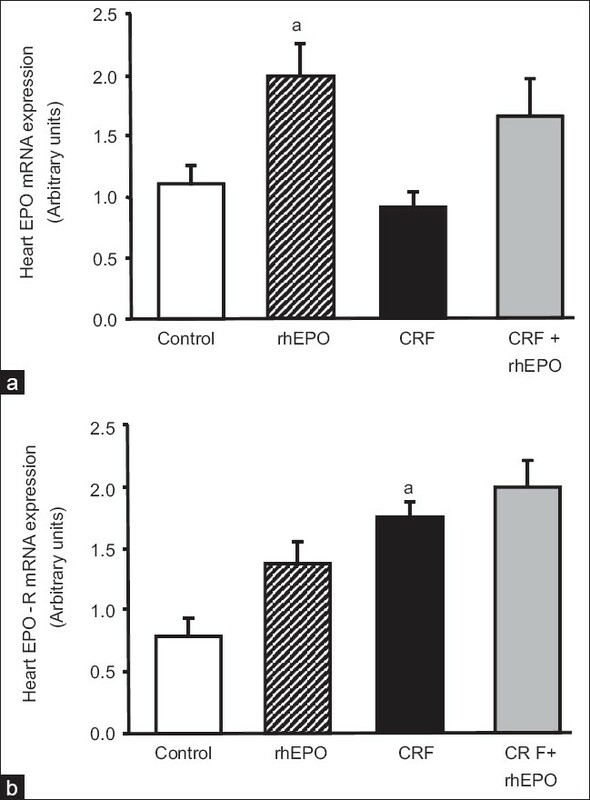 We found that rhEPO treatment, per se (rhEPO group), in the cardiac tissue, was able to significantly (P < 0.05) increase EPO gene expression [Figure 1]a, together with a trend to higher values of EPO-R [Figure 1]b, when compared with the control animals. In the CRF animals, no significant changes were encountered in EPO gene expression in this tissue [Figure 1]a, but a statistically significant higher values of EPO-R genetic expression [Figure 1]b were found when compared with the control rats. rhEPO treatment in the CRF animals (CRF+rhEPO group) showed a trend to higher values of EPO gene expression in the heart, without changes on EPO-R when compared with the CRF rats without rhEPO therapy [Figure 1]b. Figure 1: Heart mRNA erythropoietin (a) and erythropoietin receptor (b) gene expression for the groups under study, at the final time. Results are means ± SEM of arbitrary units (7 rats/group): aP < 0.05 and aaP < 0.01 vs the control group. The following proteins were evaluated as markers of the apoptotic machinery: Bax, Bcl2, Fas, FasLg, and caspases 3 and 9. Concerning the rhEPO treatment, we found in the heart tissue that rhEPO was able to promote a statistically significant increment (P < 0.01) in Bax/Bcl2 ratio gene expression [Figure 2]a, as a result of a trend to higher values of the proapoptotic protein Bax and lower of the antiapoptotic Bcl2 [Table 2]. The other markers of apoptosis in the heart tissue were also unchanged, with again a trend to higher values of caspase 3 and 9 gene expression [Table 2]. In the CRF animals, a statistically significant increment (P < 0.05) in Bax/Bcl2 ratio [Figure 2]a was found, together with no further changes on the other proteins, Fas, FasLg, and caspases 3 and 9 [Table 2]. Concerning the rats under rhEPO treatment with CRF (CRF+rhEPO group), there was a prevention of the proapoptotic effect promoted by the renal failure, with a statistically significant (P < 0.05) reduction of Bax/Bcl2 ratio when compared with the animals without rhEPO therapy [Figure 2]a due to a significant increment (P < 0.01) on Bcl2 gene expression [Table 2]. Once again, no further changes were found for the other parameters [Table 2]. To assess the influence of rhEPO treatment on heart proliferation and angiogenesis, we evaluated the following proteins: PCNA, TGF-b1, cytochrome c, and VEGF. Concerning the rhEPO treatment, per se (rhEPO group), we found a remarkable increment in PCNA mRNA gene expression in the heart (P < 0.05) [Figure 2]b. rhEPO treatment promoted no changes on TGF-b1, cytochrome c and VEGF gene expression, despite a trend to higher values of TGF-b1 and lower of cytochrome c [Table 2]. In the CRF animals, we found a trend to higher values of PCNA (0.63 ± 0.10 AU), when compared with the control animals (0.27 ± 0.07 AU) [Figure 2]b. Concerning the other markers, no changes were encountered for TGF-b1, cytochrome c, and VEGF gene expression levels [Table 2]. In the rats under rhEPO treatment with CRF (CRF+rhEPO group), PCNA gene expression was substantially elevated (P < 0.01) when compared to the CRF group [Figure 2]b. No other significant changes were encountered concerning the other proteins [Table 2]. We also assess the influence of rhEPO treatment on heart IL-2, TNF-a, NF-κB, and NOS2 and NOS3 gene expression. Concerning the rhEPO treatment, per se (rhEPO group), we found no significant changes for all the parameters analyzed in the heart tissue, despite a trend to higher expression in all of them [Figure 2]c and [Table 2]. In the CRF animals, IL-2 gene expression was higher (P < 0.05) that in the control rats [Figure 2]c, without no further significant changes on all the other markers [Table 2]. In the CRF+rhEPO group, rhEPO treatment showed a trend to prevent the IL-2 gene overexpression found in the CRF animals [Figure 2]c. Apart from those changes, a trend to higher values was found in the heart NF-κB gene expression comparing to the CRF group [Table 2]. The introduction of rhEPO therapy allowed a significant reduction of anemia-associated adverse effects, allowing for a prolonged life expectancy in end-stage renal disease stages. Apart from the anemia correction, rhEPO therapy has been associated with positive beneficial effects on nonhematopoietic cells, ,, which have been attributed to its antiapoptotic, anti-inflammatory, and antioxidant actions, that underlie the cardio- and neuroprotection in other conditions. , Functional EPO receptors have been found in several tissues, including those of the cardiovascular system, such as the endothelial cells and cardiomyocytes. , Furthermore, EPO is a key player in a broad variety of processes in cardiovascular pathophysiology, including apoptosis, cell proliferation, and ischemia. An increase in cardiac systolic function has been observed in patients with chronic heart failure treated with rhEPO. Other beneficial effects appear to be related to the proangiogenic properties on endothelial cells, which could be useful for treatment of ischemic heart disease. These findings suggest that rhEPO could provide therapeutic benefits in the management of cardiovascular diseases beyond anemia correction. Nevertheless, although enhanced EPO synthesis is viewed as an appropriate compensatory mechanism in the cardiorenal syndrome, excessive EPO synthesis in the advanced stages of both the CRF and CHF appears to be predictive of higher mortality. Therefore, for a significant percentage of patients, rhEPO loses efficacy, becoming resistant, recommending dose increment with further deterioration of heart function, most probably due to the expected hyperviscosity and thromboembolisms. ,,, In this context, earlier rhEPO therapy in anemic CKD patients might have a positive cardiorenal impact, such as previously reported in ischemic injury, contributing to organ protection/regeneration. , However, the impact of early rhEPO use, in stages of yet moderate renal failure and low cardiac deterioration, remains poorly investigated. CKD is associated with inflammatory mechanisms, viewed by the increment of acute phase protein synthesis, such as C-reactive protein, a prominent marker of inflammatory response in the general population and in CKD patients, which was reported elevated in hemodialyzed patients. Chronic inflammation is also associated with atherosclerotic cardiovascular disease (CVD) and the high rate of morbidity and mortality observed in hemodialyzed patients  could reflect the inflammatory process in CKD patients favoring CVD events. rHEPO has been shown a pleiotropic action,  which includes an anti-inflammatory activity already reported on other conditions, including in cardiomyocytes with hypoxia/reoxygenation injury, in the brain, as well as in the kidney. , In our study, CRF was not associated with significant changes on the inflammatory markers, viewed by normal gene profile of both TNF-a and NF-κb in the heart, which is in agreement with our previous assays in serum markers of inflammation. ,, However, the IL-2 gene overexpression was prevented with rhEPO, suggesting an inhibitory effect on T-cell-induced IL-2 production. Previous studies on CKD patients have shown serum IL-2 increment when compared with controls, , an effect that was reduced by rhEPO treatment, demonstrating that rhEPO has an immunomodulatory action. Our data reinforces this notion, demonstrating that the rhEPO effect is due to downregulation of CRF induced IL-2 gene overexpression on a moderate model of CRF. Because EPO has been indicated as an antioxidant tissue-protective cytokine,  we also assessed the influence of rhEPO treatment on heart gene expression of cytochrome c, viewed as a marker of mitochondrial injury, as well as on the expression of NO synthase 2 and 3, which are the key enzymes in inducible and constitutive NO synthesis and which participate in oxidative stress under unimpaired circumstances. In our model of moderate CRF, both cytochrome C and NO synthases gene expression were unchanged, suggesting that this tissue was in an earlier stage of oxidative lesion. In conclusion, in this model of moderate CRF, rhEPO treatment showed important cardiac nonhematopoietic effects, expressed mainly by the antiapoptotic and the proproliferative action on the heart. This data suggests that early rhEPO in moderate stages of CRF, before critical lesion of the tissues, might have further benefits. 1. Deicher R, Hörl WH. Anaemia as a risk factor for the progression of chronic kidney disease. Curr Opin Nephrol Hypertens 2003;12:139-43. 2. Miranda Sde P, Macedo RN, Silva Júnior GB, Daher Ede F. Cardio-renal syndrome: Pathophysiology and treatment. Rev Assoc Med Bras 2009;55:89-94. 3. van der Meer P, Voors AA, Lipsic E, van Gilst WH, van Veldhuisen DJ. Erythropoietin in cardiovascular disease. Eur Heart J 2004;25:285-91. 4. Foley RN, Parfrey PS, Harnett JD, Kent GM, Murray DC, Barre PE. The impact of anaemia on cardiomyopathy morbidity and mortality in end-stage renal disease. Am J Kidney Dis 1996;28:53-61. 5. Locatelli F, Conte F, Marcelli D. The impact of hematocrit levels and erythropoietin treatment on overall and cardiovascular mortality and morbidity - the experience of the Lombardy dialysis Registry. Nephrol Dial Transplant 1998;13:1642-4. 6. Latini R, Brines M, Fiordaliso F. Do non-hemopoietic effects of erythropoietin play a beneficial role in heart failure? Heart Fail Rev 2008;13:415-23. 7. Mastromarino V, Volpe M, Musumeci MB, Autore C, Conti E. Erythropoietin and the heart: Facts and perspectives. Clin Sci (Lond) 2011;120:51-63. 8. van der Putten K, Braam B, Jie KE, Gaillard CA. Mechanisms of Disease: erythropoietin resistance in patients with both heart and kidney failure. Nat Clin Pract Nephrol 2008;4:47-57. 9. Besarab A, Bolton WK, Browne JK, Egrie JC, Nissenson AR, Okamoto DM, et al. The effects of normal as compared with low hematocrit values in patients with cardiac disease who are receiving hemodialysis and epoetin. N Engl J Med 1998;339:584-90. 10. Lipsic E, Schoemaker RG, van der Meer P, Voors AA, van Veldhuisen DJ, van Gilst WH. Protective effects of erythropoietin in cardiac ischemia: from bench to bedside. J Am Coll Cardiol 2006;48:2161-7. 11. Garrido P, Reis F, Costa E, Teixeira-Lemos E, Parada B, Alves R, et al. Characterization of a rat model of moderate chronic renal failure--focus on hematological, biochemical, and cardio-renal profiles. Ren Fail 2009;31:833-42. 12. Garrido P, Reis F, Costa E, Almeida A, Parada B, Teixeira-Lemos E, et al. Effect of recombinant human erythropoietin in a rat model of moderate chronic renal failure - focus on inflammation, oxidative stress and function/renoprotection. The Open Drug Discovery J 2010;2:25-32. 13. Teixeira AM, Garrido P, Santos P, Alves R, Parada B, Costa E, et al. Recombinant human erythropoietin treatment protects the cardio-renal axis in a model of moderate chronic renal failure. Ren Fail 2010;32:1073-80. 14. Fandrey J. Oxygen-dependent and tissue-specific regulation of erythropoietin gene expression. Am J Physiol Regul Integr Comp Physiol 2004;286:R977-88. 15. Jelkmann W. Control of erythropoietin gene expression and its use in medicine. Methods Enzymol 2007;435:179-97. 16. Lappin T. The cellular biology of erythropoietin receptors. Oncologist 2003;8 Suppl 1:15-8. 17. Weidemann A, Johnson RS. Nonrenal regulation of EPO synthesis. Kidney Int 2009;75:682-8. 18. Vandesompele J, De Preter K, Pattyn F, Poppe B, Van Roy N, De Paepe A, et al. Accurate normalization of real-time quantitative RT-PCR data by geometric averaging of multiple internal control genes. Genome Biol 2002;3:RESEARCH0034. 19. Livak KJ, Schmittgen TD. Analysis of Relative Gene Expression Data Using Real-Time Quantitative PCR and the 2- ÄÄCT. Method. Methods 2001;25:402-8. 20. Bogoyevitch MA. An update on the cardiac effects of erythopoietin cardioprotetion by erythropoietin and the lessons learnt from studies in neuroprotection. Cardiovasc Res 2004;63:208-16. 21. Manolis AS, Tzeis S, Triantafyllou K, Michaelidis J, Pyrros I, Sakellaris N, et al. Erythropoietin in heart failure and other cardiovascular diseases: hematopoietic and pleiotropic effects. Curr Drug Targets Cardiovasc Haematol Disord 2005;5:355-75. 22. Anagnostou A, Liu Z, Steiner M, Chin K, Lee ES, Kessimian N, et al. Erythropoietin receptor mRNA expression in human endothelial cells. Proc Natl Acad Sci U S A 1994;91:3974-8. 23. Tramontano AF, Muniyappa R, Black AD, Blendea MC, Cohen I, Deng L, et al. Erythropoietin protects cardiac myocytes from hypoxia-induced apoptosis through an Akt-dependent pathway. Biochem Biophys Res Commun 2003;308:990-4. 24. Raddino R, Robba D, Caretta G, Bonadei I, Teli M, Zanini G, et al. Erythropoietin: a new perspective in cardiovascular therapy. Monaldi Arch Chest Dis 2008;70:206-13. 25. Abdelrahman M, Sharples EJ, McDonald MC, Collin M, Patel NS, Yaqoob MM, et al. Erythropoietin attenuates the tissue injury associated with hemorrhagic shock and myocardial ischemia. Shock 2004;22:63-9. 26. Ma R, Xiong N, Huang C, Tang Q, Hu B, Xiang J, et al. Erythropoietin protects PC12 cells from beta-amyloid(25-35)-induced apoptosis via PI3K/Akt signalling pathway. Neuropharmacology 2009;56:1027-34. 27. van der Meer P, van Veldhuisen DJ. [New applications of erythropoietin in cardiovascular disease: from haematopoiesis to cardiac protection]. Ned Tijdschr Geneeskd 2008;152:923-7. 28. Moriyama MT, Tanaka T, Morita N, Ishii T, Chikazawa I, Suga K, et al. Renal protective effects of erythropoietin on ischemic reperfusion injury. Cell Transplant 2010;19:713-21. 29. Pallet N, Bouvier N, Legendre C, Beaune P, Thervet E, Choukroun G, et al. Antiapoptotic properties of recombinant human erythropoietin protects against tubular cyclosporine toxicity. Pharmacol Res 2010;61:71-5. 30. Toba H, Sawai N, Morishita M, Murata S, Yoshida M, Nakashima K, et al. Chronic treatment with recombinant human erythropoietin exerts renoprotective effects beyond hematopoiesis in streptozotocin-induced diabetic rat. Eur J Pharmacol 2009;612:106-14. 31. Wang W, Zhang J. Protective effect of erythropoietin against aristolochic acid-induced apoptosis in renal tubular epithelial cells. Eur J Pharmacol 2008;588:135-40. 32. Timmer SA, De Boer K, Knaapen P, Götte MJ, Van Rossum AC. The potential role of erythropoietin in chronic heart failure: From the correction of anemia to improved perfusion and reduced apoptosis? J Card Fail 2009;15:353-61. 33. Fu P, Arcasoy MO. Erythropoietin protects cardiac myocytes against anthracycline-induced apoptosis. Biochem Biophys Res Commun 2007;354:372-8. 34. Tramontano AF, Muniyappa R, Black AD, Blendea MC, Cohen I, Deng L, et al. Erythropoietin protects cardiac myocytes from hypoxia-induced apoptosis through an Akt-dependent pathway. Biochem Biophys Res Commun 2003;308:990-4. 35. Bernhardt WM, Eckardt KU. Physiological basis for the use of erythropoietin in critically ill patients at risk for acute kidney injury. Curr Opin Crit Care 2008;14:621-6. 36. Schindler R, Senf R, Frei U. Influencing the inflammatory response of haemodialysis patients by cytokine elimination using large-pore membranes. Nephrol Dial Transplant 2002;17:17-9. 37. Hung CY, Chen YA, Chou CC, Yang CS. Nutritional and inflammatory markers in the prediction of mortality in Chinese hemodialysis patients. Nephron Clin Pract 2005;100:c20-6. 38. Chatterjee PK. Pleiotropic renal actions of erythropoietin. Lancet 2005;365:1890-2. 39. Chang YK, Choi DE, Na KR, Lee SJ, Suh KS, Kim SY, et al. Erythropoietin attenuates renal injury in an experimental model of rat unilateral ureteral obstruction via anti-inflammatory and anti-apoptotic effects. J Urol 2009;181:1434-43. 40. Qin C, Xiao YB, Zhong QJ, Chen L, Wang XF. Anti-inflammatory effect of erythropoietin pretreatment on cardiomyocytes with hypoxia/reoxygenation injury and the possible mechanism. Chin J Traumatol 2008;11:352-8. 41. Costa E, Lima M, Alves JM, Rocha S, Rocha-Pereira P, Castro E, et al. Inflammation, T-cell phenotype, and inflammatory cytokines in chronic kidney disease patients under hemodialysis and its relationship to resistance to recombinant human erythropoietin therapy. J Clin Immunol 2008;28:268-75. 42. Debska-Slizien A, Rutkowski B, Manitius J, Zdrojewski Z, Szo³kiewicz M, Bu³³o B, et al . Influence of erythropoietin on immunological system of patients with chronic renal failure. Pol Merkur Lekarski 2003;15:326-7. 43. Efthimiadou A, Pagonopoulou O, Lambropoulou M, Papadopoulos N, Nikolettos NK. Erythropoietin enhances angiogenesis in an experimental cyclosporine A-induced nephrotoxicity model in the rat. Clin Exp Pharmacol Physiol 2007;34:866-9. 44. Shivji KK, Kenny MK, Wood RD. Proliferating cell nuclear antigen is required for DNA excision repair. Cell 1992;69:367-74. 45. Essers J, Theil AF, Baldeyron C, van Cappellen WA, Houtsmuller AB, Kanaar R, et al. Nuclear dynamics of PCNA in DNA replication and repair. Mol Cell Biol 2005;25:9350-9. 46. Bagnis C, Beaufils H, Jacquiaud C, Adabra Y, Jouanneau C, Le Nahour G, et al. Erythropoietin enhances recovery after cisplatin-induced acute renal failure in the rat. Nephrol Dial Transplant 2001;16:932-8. 47. Schmeding M, Boas-Knoop S, Lippert S, Ruehl M, Somasundaram R, Dagdelen T, et al. Erythropoietin promotes hepatic regeneration after extended liver resection in rats. J Gastroenterol Hepatol 2008;23:1125-31. 48. Johnson DW, Forman C, Vesey DA. Novel renoprotective actions of erythropoietin: new uses for an old hormone. Nephrology (Carlton) 2006;11:306-12. Tarry-Adkins, J.L., Blackmore, H.L., Martin-Gronert, M.S., Giussani, D.A., Ozanne, S.E.